Cloudy skies at yesteray's CicLAvia event. All photos: Joe Linton/Streetsblog L.A.
Sunday’s early morning rain cleared up in time for another excellent installment of L.A. County’s premiere open streets festival. CicLAvia Culver City Meets Mar Vista + Palms took place on six and a half miles of Westside Streets from Venice Boulevard’s Great Streets project to Culver City and Palms Metro Expo Line stations. The route was similar to earlier Washington Boulevard-centered Culver City routes in 2015 and 2107, but included a Palms Motor Avenue spur for the first time ever. The event was presented by Metro, as part of the agency’s ongoing open streets grant program. Early on, the streets were wet from morning rains. Though many people showed up around the 9 a.m. start time, the crowds were not massive. As it became clear that early rain would given way to cloudy skies, tens of thousands of cyclists, runners, skaters, and others crowded onto the route. Nearly ten years into the phenomenon that is CicLAvia, it is difficult to find more to say about the popular recurring event. As usual, all kinds of people of all shapes, sizes, ages and ethnicities smiled their way along wonderfully quiet streets. Restaurants along the route were crowded with bikes out front. 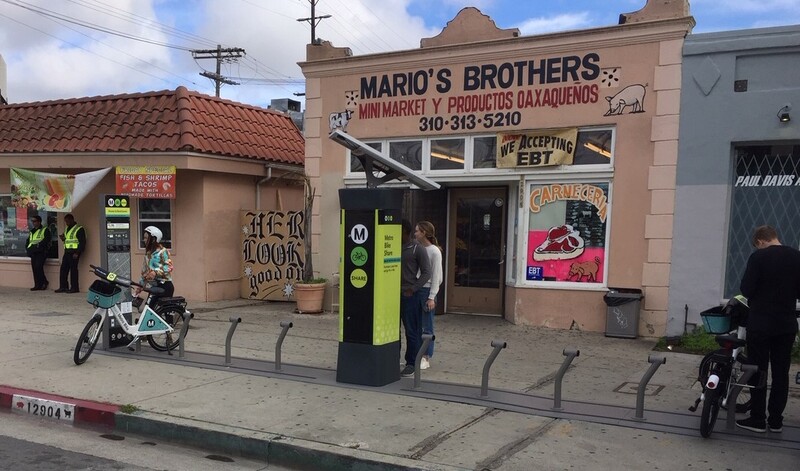 Angelenos got a glimpse of what a safer, healthier, more sustainable, and better connected city might look like. 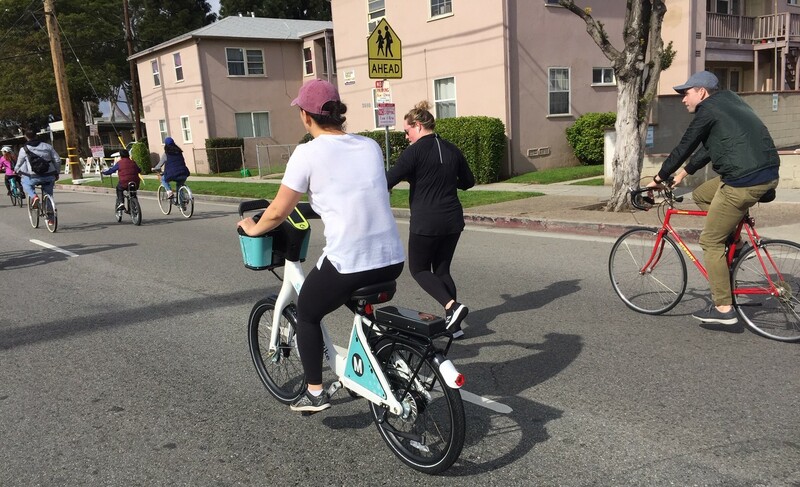 Making their first appearance at Southern California open streets were some new mobility options available on the Westside: Metro Bike Share’s new white smart-bikes and Jump’s orange dockless shared e-bikes. Many participants used e-scooters to enjoy the route – though trusty tried-and-true bikes remain predominant. 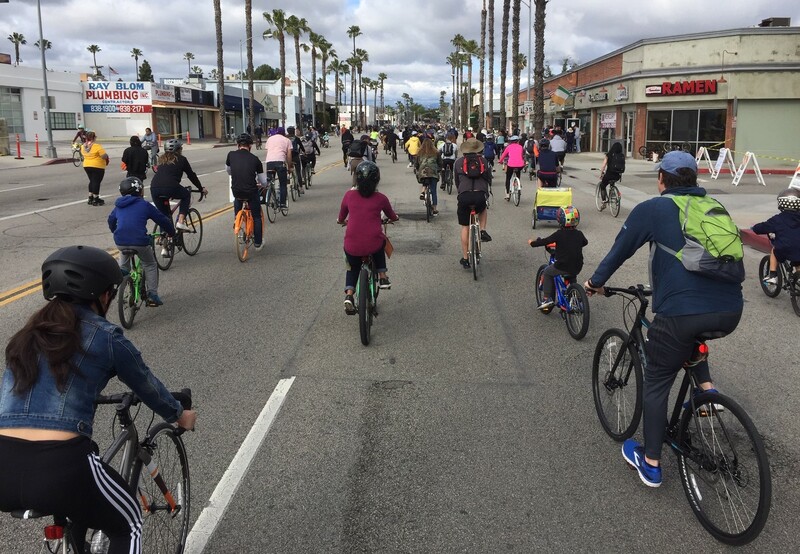 Readers – how was your CicLAvia yesterday? Share via the comments below. Highlight was the second most car-centric council member on Los Angeles City Council kicking off this CicLAvia. Yes, I’m talking about Paul Koretz. That champion of the environment, that fitness nut who puts Jack LaLanne to shame. The man who loves skaters, scooters, bikes, buses, trains, and pedestrians alike. 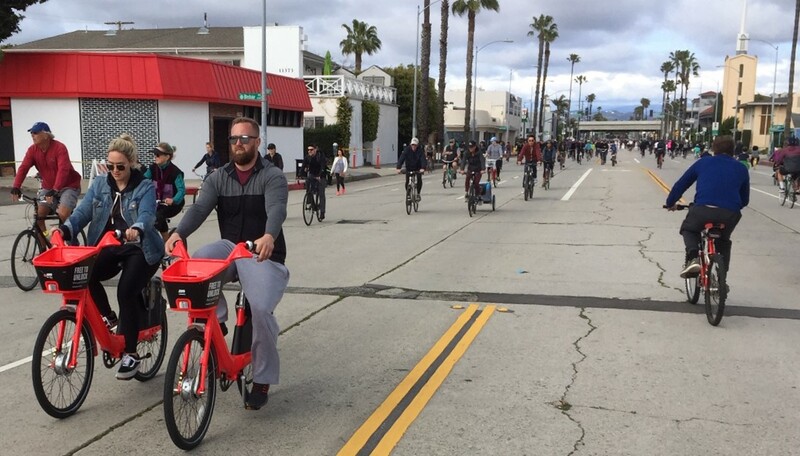 He actually left his zoning-protected single family home, stepped out of his electric car, and stood before the assembled in Culver City with neither a reusable drinking straw nor a piece of recycled city hall typhus carpet, and proclaimed Sunday as CicLAvia Day. Hey, what’s up with the next CicLAvia having only two miles in Wilmington? Did Peeedro balk? We rode down from Hollywood around 11 a.m. No rain, just cool, clean air, fluffy clouds, just the right amount of bike traffic. Really appreciate the bike valets and the benches and tables. We spent the rest of the day riding, eating lunch, and finding a chocolate coffee shop. I have been coming to CicLAvia since 10/10/10 and this may have been the best one ever! (or maybe this one and the Phil 100). The young women staffers at Mike Bonin’s tent seemed genuinely surprised when I told them I was a big fan of Mike’s! Also, good tamales at one of the stops and tacos at Loqui, and a really awesome pair of guys on lowrider bikes with speakers playing the same music, super clever. Glad the rain cleared up! Actually Joe, I did not see a lot of scooters. Most people were on their bikes or walking/jogging. The Palms branch was notably lightly used and there was not clear direction from the Palms Metro station to Ciclavia. Once on the main route, the route felt used but not crowded, as past Ciclavias on the Westside were.